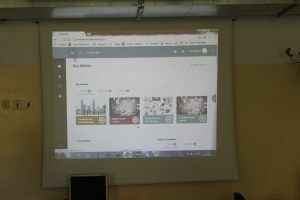 primeTECH project and its results were introduced to primary school teachers in an information day which and took place on May 7th in Cibla Secondary School, Cibla, Latvia. The info day started with a presentation providing information about the project which was followed by a discussion about the importance of ICT in primary education. Teachers had a chance to discuss why they found acquiring digital competences important; they also mentioned obstacles that sometimes make it difficult to use ICT fully in their classes and shared tips how these obstacles could be overcome. After the discussion teachers had a chance to register for the primeTECH e-course, take the pre-assessment tests, try out the modules and ask questions. Finally, everyone attending the info day could sign the petition thereby showing their support for opportunities for primary school teachers to develop their digital skills. Overall, participants of the info day were interested in the project results and found the primeTECH e-course useful and its contents engaging.